Aston Martin will have the worlds first Hybrid Hydrogen Rapide S racer that will make its global debut at ADAC Zurich 24 hours of Nurburgring. 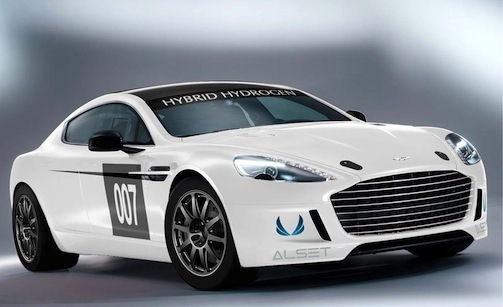 Aston Martin will have a number of firsts with the new Hybrid Hydrogen Rapide S racer. The British brand will be the first automaker to race a hybrid hydrogen car at the 41st ADAC Zurich 24 Hours of Nurburgring next month. The pioneering Hybrid Hydrogen race car is based on the new Rapide S four-door sports car that is arriving in Aston Martin showrooms around the globe this month. The race car will be the the first hydrogen-powered car to compete in an international event as well as the first zero CO2 emissions sports car to complete a race pace lap at the Nurburgring 24-hour race. Aston Martin will be out to prove that today’s hydrogen technology is safe and reliable on one of the most demanding circuits in the world. They will showcase the technology at Nurburgring which is nicknamed the “Green Hell.” After a century of building automobiles, Aston Martin is leading the industry in innovation and technology. Why is Aston Martin developing this technology in a race car? Most automakers test their new technology in the autosports arena. It gives them valuable insights into how to transfer the technology to everyday cars. Aston Martin’s engineers are working with hydrogen experts Alset Global to develop the new technology. The two companies have developed a prototype twin turbocharged 6.0-litre V12 engine that will power the Nurburgring car. The Rapide S racer is capable of running on pure gasoline, pure gaseous hydrogen, or a blend of both. In pure hydrogen mode, the racer should be able to run a zero CO2 emissions lap of the Nordschleife while emitting virtually only water from the tailpipe. Aston Martin is out to show the world that their technology is ready to compete in the 24 Hours of Nurburgring. Aston Martin says the new technology will provide a powerful and dynamic propulsion system that provides sports car performance but with a carbon footprint more akin to that of a supermini. And of course safety has been taken into consideration and is paramount. The system includes four ultra-high strength carbon fiber tanks (two tanks housed next to the driver and two in the boot of the car), holding a total of 3.5kg of hydrogen stored at a pressure of 350 bars. The hybrid hydrogen technology enables the new Rapide S to achieve 190 mph and it will sprint from 0 to 62 mph in just 4.9 seconds. We could be seeing the future of performance production cars. The new Aston Martin Hybrid Hydrogen Rapide S racer race car showcases Aston Martin’s commitment to engineering innovation. It will be interesting to see how the hybrid hydrogen racer competes during the grueling ADAC Zurich Nürburgring 24-hour race. "The hybrid hydrogen technology enables the new Rapide S to achieve 190 mph and it will sprint from 0 to 62 mph in just 4.9 seconds.
" But is that is gas mode or hydrogen mode? I remember BMW's 7 series hydrogen car that has a 12 cylinder engine but wasn't much faster than an econobox. That is a great question...I'm sure it's gas mode to get those performance numbers. Thanks for reading! Actually, the car is not a hydrogen fuel cell, but a hydrogen BURNING vehicle, so it would achieve its top performance when running on a hydrogen-heavy fuel mix, which has a much faster ignition and burn rate than does gasoline vapor. Hydrogen alone is inefficient in current valve and piston combustion engines, so H2 alone wouldn't do the job as efficiently for top performance. I'm kind of surprised to see Aston spearheading this since Mazda is the company with the most experience fielding H2 burning cars.